• Children 12 years old and under must never ride in the front seat, except in a Mercedes- Benz authorized BabySmart™ compatible child seat, which operates with the BabySmart™ system installed in the vehicle to deactivate the front passenger front air bag when it is installed properly. Otherwise they will be struck by the air bag when it inflates in a crash. If this happens, serious or fatal injury will result. illuminated, indicating that the front passenger front air bag is deactivated. use the BabySmart™ restraint to transport a child on the front passenger seat until the system has been repaired. The BabySmart™ air bag disabling system ONLY works with specially adapted child restraint systems. It does not work with child restraint systems that are not compatible with BabySmart™. Never place anything between the seat cushion and the child restraint system (e.g. a cushion), as this reduces the effectiveness of the BabySmart™ air bag deactivation system. The underside of the child restraint system must lie against the seat cushion of the frontpassenger seat. In the event of an accident, an incorrectly installed child restraint system could injure the child instead of offering protection. Observe the manufacturer's instructions when installing special child restraint systems. Your vehicle is equipped with a BabySmart™ system. Special child restraint systems which are compatible with BabySmart™ are necessary for deactivating the front-passenger air bag. indicator lamp 1 lights up. If you have any questions regarding the special BabySmart™- compatible child restraint systems, consult an authorized Mercedes-Benz Center. indicator lamp 1 does not light up. Do not leave any switched on notebooks, mobile phones, electronic tags (e.g. a ski pass) or similar electronic devices on the front-passenger seat. Signals emitted from such devices can interfere with the BabySmart™ air bag deactivation system. indicator lamp not lighting up during the selftest. simultaneously in the instrument cluster, the system is malfunctioning. 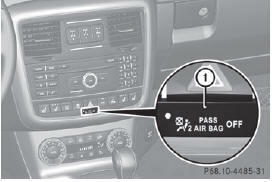 The frontpassenger air bag could deploy without cause, or may fail to deploy in the event of an accident. Have the system checked as soon as possible at an authorized Mercedes-Benz Center. when the SmartKey is turned to position 1 or 2 in the ignition lock. light up or is always lit, then the system is malfunctioning. 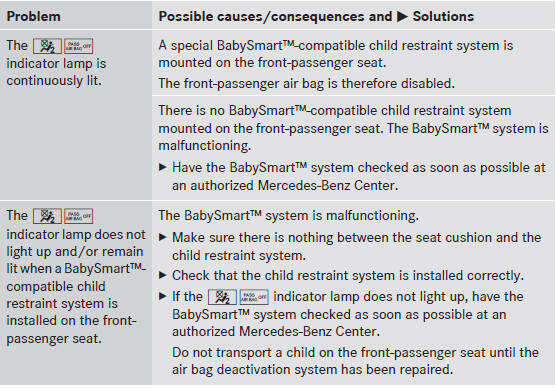 Have the BabySmart™ system checked at an authorized Mercedes- Benz Center before transporting a child on the front-passenger seat. For further information, see "Problems with air bag deactivation system" .